The academic year drew to a glittering close in Coláiste Choilm Swords with a spectacular end of year Ceiliúradh (Celebration) . 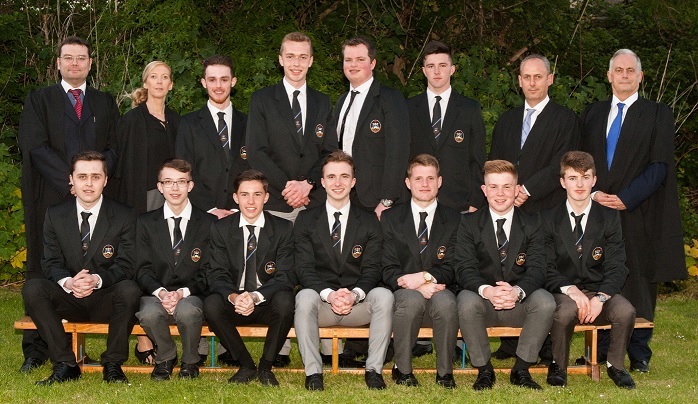 The ceremony is more than a prizegiving; it is a journey celebrating the story of Coláiste Choilm from its very early origins to the achievements of the current academic year. The event is run by a dedicated committee of Senior Students who worked tirelessly on everything from laying out the hall, welcoming special guests and audio visual production directed by Aaron O’Neill (6th year). Philip Daly from 6th year had the tough job of ‘Sergeant at Arms’ looking after and organising over 300 pieces of silver and glassware to be presented. The committee and event is overseen by two teachers; Ms Sinead Hynes and Mr Karl Foster. It was opened by Evan Mannion (5th year) who welcomed patrons and introduced Sean O’Brien and Philip Daly of 6th year who read the opening prayer which inspired by the coming of the Christian Faith to Ireland with the arrival of St Patrick. Then in the darkened hall, 5 photographs appeared on a large screen; one from each decade of Coláiste Choilm and each accompanied to a sound of a church bell. Then prize winners entered in a procession to a piece of music inspired by our school’s patron saint, St Colmcille. Special guests included former staff members Ms Maureen Hefferenan and Mr Theo Farrell who were joined by trustee members of the Board of Management. Presenters of awards were Mr Alfred Bryan (Chairperson of the Board of Management) and Mr Brian Howley (Class of ’81). 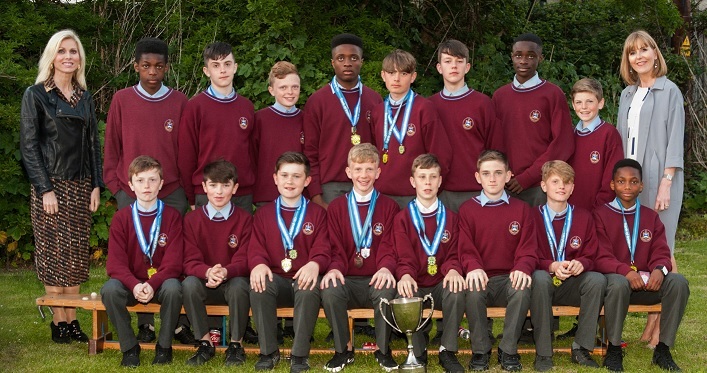 Mr David Neville (Principal) and Mr Cathal Boyle (Deputy Principal) proclaimed each winner who received a warm round applause from a packed gymnasium. This year there was so much to celebrate, that the Ceiliúradh was held over two nights. Brother Canny Shield (Overall Best Leaving Certificate) Darren Corr (605 points, Entrance Scholar, UCD). Alumni Award to Ian Kenny (Class of 2013) for contribution to the dramatic arts. Ian has starred in the recent hit movie Sing Street. The Maureen Heffernan award for Dedication and Commitment to School Life was presented to 2nd year student, Joseph O’Reilly. 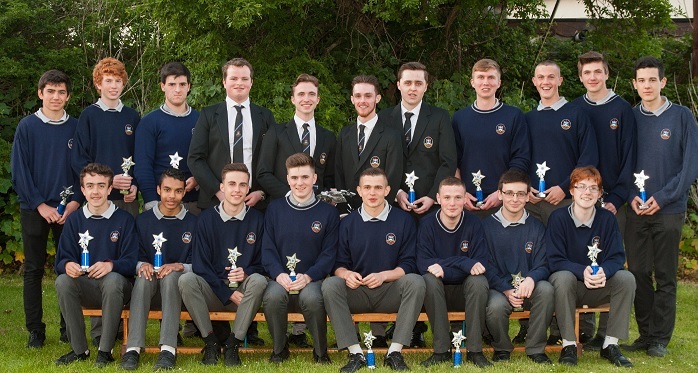 Awards for GAA, hurling, soccer, basketball, and rugby were also presented to individual students from 1st – 6th year. 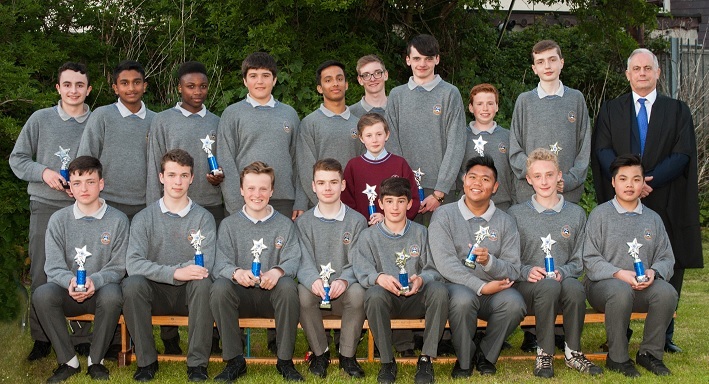 Enterprise Awards – Coláiste Choilm was the 2016 winner of the Enterprising School Spirit Award and a host of enterprise awards were presented to winning students from 1st and 2nd year. The Overall Sportsman of the Year (Brother Walsh Award) was presented to Arran Molloy, 6th year, who also received an award for Personal Determination to Succeed in Mathematics. 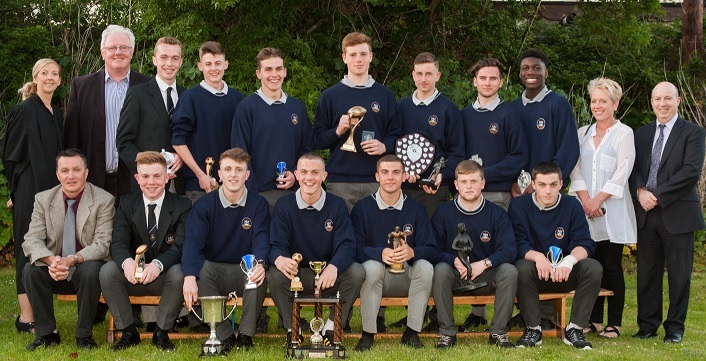 International Sportsmen, Conor Fowler (Soccer), Federico Mazzola, Kyle Grace and Cian Burrowes (Martial Arts) also received awards. Awards were also presented in the Applied Arts Paul Hanngon (Junior Art and Design), Jake Cantwell (Senior Art and Design) James O’Donnell (Materials Technology Wood) Sanjay Sivandkumar (Junior Technology), Eoin Byrne (Senior Technology), Sam Thompson (Construction Studies) and Jerry Ng ( Design and Communication Studies). After the evening ceremony, students joined their Parents and Teachers for a special reception hosted by the Coláiste Choilm Parents Council. 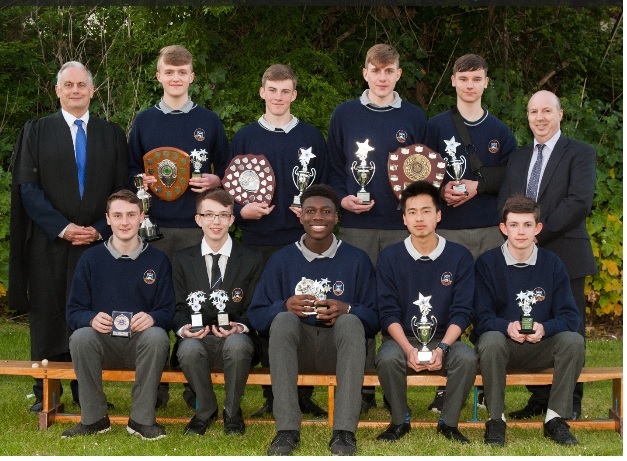 Photo 2	Mr David Neville (Principal), Sean Mok, (Entrance Scholar TCD) Brian Shortall, (DCU) Darren Corr,(Entrance Scholar UCD) Mr Cathal Boyle (Deputy Principal) Winners of the Theo Farrell Award for Leaving Cert Physics. Photo 3	Joseph O’Reilly from 2L winner of the Maureen Heffernan Award for Dedication and Commitment to School Life, pictured with Ms Maureen Heffernan. Photo 4	Members of the 1st year FAI Leinster Championship Squad with their Year Heads Ms Healy and Ms Felton. Photo 6	Some of the Senior Students who won prizes pictured with members of the Ceiliúradh Committee. 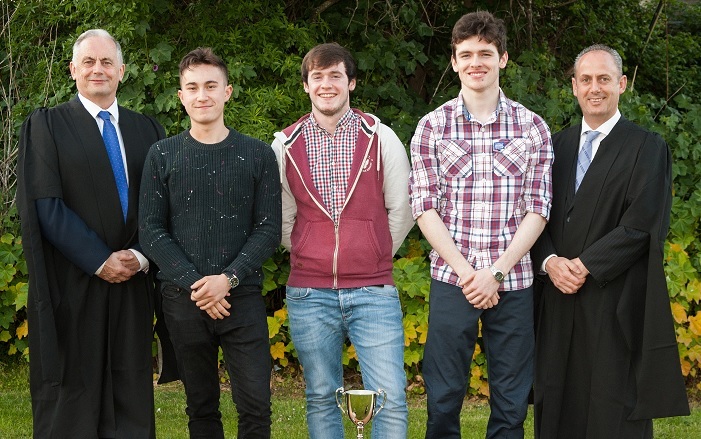 Photo 8	Senior prize winners with Mr David Neville (Principal) and Presenter of Prizes Mr Brian Howley, (Class of 1981).